I know that regardless of celebrity status, people are just people. They get sick, they get depressed, they go to the grocery store and they get their hair cut just like you and me. Despite understanding that, it’s still weird for me to see Wil Wheaton and Greg Grunberg from Heroes chatting live on the internet. There’s a voyeuristic quality to celebrity blogging/tweeting etc that I find simultaneously creepy and intriguing. I do think it helps to humanize celebrities when they share the phone pics they took of their coffee at Denny’s on TwitPic and such. Maybe if more celebs were open about the mundane details of their “day to days” we would stop obsessing over them. Or maybe it would encourage a dangerous new degree of stalkerism. I read a few geek-celebrity blogs (JoCo, WWDN, Jackson Public) and follow plenty of marginally famous people on Twitter. I guess I like to see that we are going through the same stuff despite the gap in our social statuses, incomes, and legions of followers. Do any famous people read HE? I only know of 2 or 3 other well known cartoonists that do. No one else has ever come right out and said it. I wonder. What celebrity Tweeters, Bloggers, etc do you follow and why? Speaking of Twitter, thanks to @SkawtNYC for unwittingly naming this comic. Posted in Uncategorized and tagged barack obama, greg grunberg, heroes, Internet, social networking, tv, twitter, wil wheaton. I know how you feel, so far for me Twitter has mostly been about feeling strangely "in" (though not really) with various famous or semi-famous users (Felicia Day, John Hodgman, Stephen Fry etc., along with Wil Wheaton and Greg Grunberg), just because they come across so….Human. None; I don't have any hero-worship/cult of personality shrines. Enjoying the podcast here is probably the closest I get. I know it shouldn't, but I was on WilW's Twitter recently and saw this as it happened. It's weird. They have a mutual friend (some puppet master guy on Heroes, I dunno. I gave up on that show.) who works on the show, so I guess that's how they know each other now. This humanizes Greg Grunberg, and sort of makes it a bit harder to hate the show he is working on. I may not know him, per se…But if you were close friends with a person whose oeuvre was so open to criticisms, what would you do? If you were friends with Greg Grunberg IRL, would you still watch Heroes? And if so, is it out of loyalty? Even if the show is terrible? sadly, most of my followers are probably from either the FB forums, or the PA forums. My most famous followers are probably the lovely eskimo Denise, and sleepy mexican Eli. And I think they were just being nice. OMG… I love Greg Grunberg (he's so hot!). I may have to finally get a Twitter just so I can start following him. 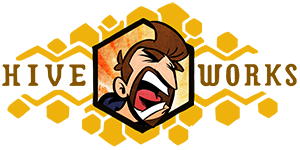 Hey, apparently Wil Wheaton reads your comic… or at least was linked to it. Check out his most recent WWDN post. Fame is yours! @stephenfry is another one who's new to twitter and enjoying it – he took the twitterverse to Africa with him. @JohnCleese is randomly funny, as well. Twitter is awesome for getting to interact randomly with people, or just read them. i wasn't even aware this site was wanged until Joel said something. Site seems fine to me. I know how you feel with the "in-ness" with celebs. I freaked out when I saw that Stephen Fry was following me (even though he follows all his followers). I follow David Hewlett and Wil Wheaton b/c they make the mundane freaking hilarious, they are close to my age so I get their culture references, and they seem like genuinely nice men who respect their fans. I like that they are all typing on Macs…. nice touch. Its funny that we both think Twitter makes celebs "Human" when its the fans that rob them of their inherant humanity in the first place. Its not like anyone starts with with a goal in mind of losing all their privacy and having people obsess over them. They ARE human. Its just hard to remember some times. 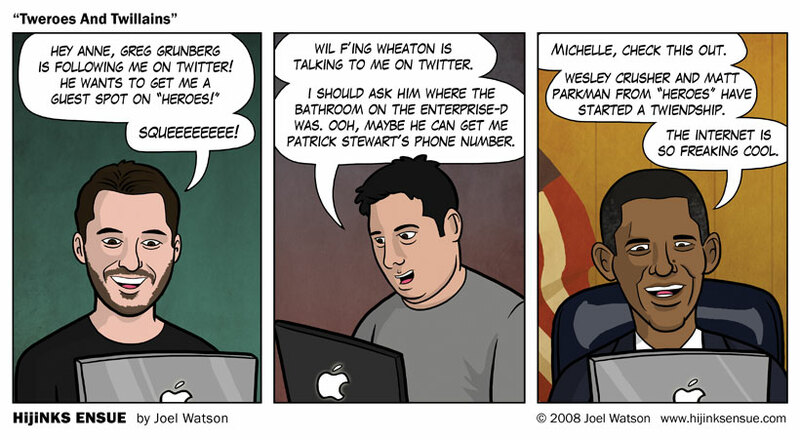 Well I know Obama and WilW are Mac users. I assume GG is since he has an iphone. I started following @wilw, @greggrunberg, and @dhlawrencexvii when this whole thing broke out, but I've been reading Wil's blog for a long time. I also read the blogs of Larry Lessig, Mark Shuttleworth (he rarely updates), Bram Cohen (BitTorrent creator), jwz (Nullsoft creator), Lew Rockwell, and Linux Torvalds. I follow @yoochild (editor of LinuxJournal) and a few other LinuxJournal folks, and @magichat, the delicious beer. There is the mystery of the "Circle Squee." But as an actor GG's computer use is more likely to be recreational or platform-independant, thus leaning more towards the Mac given Apple's fashion status in the US. If the movie ever happens, you gonna become TR2N Guy, Jay? I suppose having won the election Obama doesn't have anything better to do for the next month and mess about on-line. I sure didn't start out with any such goal in mind. I know I'm the same guy I was in March 2004, even if the rest of the net thinks otherwise. Did you find the comic through WWDN? Yes, I did. I didn't know you'd drawn me…that looks nifty. Thanks! Webcomic people I follow: @hijinksensue, @djcoffman, @dcorsetto, @mumblepuss. The majority of the people I follow, it's because news seems to travel faster on Twitter than anywhere else, and I like to be in the know… plus, it's interesting to see as the people I follow, famous or otherwise, start following and interacting with other people I know and follow. There are even gadgets that hook up to Twitter now to tell you when your plants need watering. Seriously, I kid you not. thinkgeek.com ftw. We only squee in the privacy away from our other friends, unless us and said male friends are squeeing together. It's so hard to find time to squee in between the hunting ferocious animals in the jungle and tearing apart bunnies with our teeth, ya know? hahah y'know, I sometimes cynically wonder if webcomic creators realise that mentioning Wil Wheaton will expose them to a vast army of geeks. I don't really mind if so, as I've discovered this webcomic through it… I, too, have been following this budding Twiendship. The internet is so freaking cool. They vary from "Famous" to "internet famous", but they're all superawesome. Ah, yes–the strange, twilight world of the heterosexual. If you could avoid using that T word for at least a year or two when speaking of me, I'd appreciate it 🙂 I tell you, an emo vampire and a silly girl falling in love, I'm glad I'm not a teenager anymore, because I wouldn't be able to sit through that with a date. Sweet! And a cameo would be awesome. Thinkgeek's temperature-controlled LED fitting for bathroom and kitchen taps have become mainstream over here now – I was looking through a kitchen catalogue and there they were! I´m following Felicia Day´s cool project The Guild and the immensely funny and productive British author, actor and broadcaster Stephen Fry. And you´re right, it makes me not feel "closer" in an obsessive way. They´re just like you and me. They have goals or are annoyed by the same things as we are. I mean I knew that before but it´s a good thing to see it like that. I helped Warren Ellis achieve a momentary fail whale. Does that count? I think straight men SQUEE in private. I hear they'll do lots of *stuff* in private. A restraining order is one thing, but a Twitter block can lead to ruin! not really. Twitter is notoriously fail-whaley. I met Wil Wheaton at PAX, which for me was sort of surreal for me but he's pretty much just a dude. I expect I will. The movie is definitely happening, and I like what I've seen so far. To answer another common question: They haven't asked me to appear in it as yet. If they do, I'm there. I agree with your assessment about the stalker qualities inherent in my following of @wilw or reading of Dooce. It doesn't feel like my blog readers are stalking me, though, so hopefully Wil Wheaton & Heather Armstrong don't feel like I'm stalking them, either (I'm not…I swear!). Jon Rosenberg, Jeph Jacques, Jeffrey Rowland, and William Beckett. I am a webcomic nerd and William Beckett is pretty and I have height jealousies. That is all.